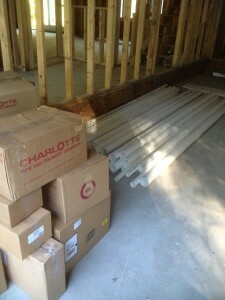 The stock has been delivered and we are ready to install the PVC drains at this custom built home in Framingham. Along with our regular plumbing services, hot water tank replacements, boiler replacements, and emergency response we also offer new construction plumbing. We work directly with the home builder to perfectly place all plumbing fixtures to exact specifications. Custom vanities and kitchens are not a problem for our team of plumbers. 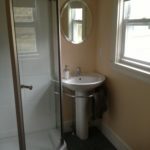 Contact us at Joe Kaufman Plumbing & Heating, at 61 Nicholas Road in Framingham MA (508-875-2593) if you are considering new construction or kitchen and bathroom remodels. We can help guide you through the entire process. We are now providing emergency plumbing and disaster relief services in the greater Boston and Metrowest areas. 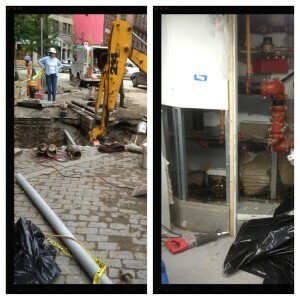 This water main leak flooded the basements of multiple businesses. We were able to remove all the customers existing plumbing to give access to the emergency companies demolition crew. Once we arrive and remove the damaged plumbing fixtures, they proceed to cut and dry walls and remove any debris and spoiled items. Our rapid response times allowed the customers to be cleaned, dried, inspected and back in business in a matter of days. In the restaurant business there is no time to waste and we were able to provide the plumbing service that allowed our customer to get back on track.